Today was one of those hot-hazy-and-humid summer days in New York when the air had a palpable, spongy weight, the subway stations could only be described as "infernal," and every trash receptacle was emitting its own unique stench. As a consequence, everyone was sweaty and miserable, and everyone — including me — was in a bad mood. One of the small comforts of my day was a sample vial of La Cologne de Rosine, the latest release from Les Parfums de Rosine, which refreshed me at a moment when I couldn't have tolerated my usual powdery or spicy-sweet floral fragrances. La Cologne de Rosine is a rose-tinted interpretation of a traditional Eau de Cologne, with notes of bergamot, mandarin, rose, freesia, violet, white musk, cedar and amber. It was developed for Rosine by perfumer Nicolas Bonneville. If you've read Robin's recent posts on "old school" and "new wave" summer colognes, you may be in the mood to break out your own favorite colognes, regardless of the weather. I'd happily add La Cologne de Rosine to the "new wave" list. It begins with a tart lemons-and-oranges accord that cuts right through the heat. The rose isn't far behind, and it's a very bright, airy rose that shouldn't scare away rosephobics. I really like the watercolor-floral heart of La Cologne de Rosine — it's just enough of a twist on the traditional Eau de Cologne formula to make this fragrance feel like a Rosine creation. Pink roses, a few freesia petals, and some very clean woods in the base, plus a citrusy ripple-effect throughout, and you're done. The staying power feels more like an Eau de Toilette than an Eau de Parfum (i.e., it doesn't last more than a couple of hours on my skin), but colognes don't typically have much endurance anyway. I'd categorize La Cologne de Rosine alongside Rosine's other sheer, zingy roses, including Diabolo Rose and Un Zeste de Rose. I wish I could somehow sneak a few bottles into Sephora and department stores where women might be looking for a hot-weather perfume — it's fresh and light, but not dumbed-down, and it still smells like a fragrance rather than some functional product. And if it made me even slightly less cranky on a sweaty late-July day, it's worth keeping in mind for any heat waves you may face in the near future. Les Parfums de Rosine La Cologne de Rosine is available in 100 ml Eau de Parfum. 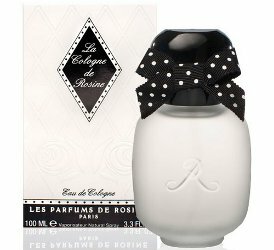 For purchasing information, see the listing for Les Parfums de Rosine under Perfume Houses. Your review is fantastic, thanks. The interesting thing for me….not having had the opportunity to inhale the scent….is that I would never have associated a cologne type scent with that bottle. If I came across that on a counter I would immediately assume it was a powdery, sweet- floral. So,the lesson for me is, never judge a perfume by its bottle. I am such a doofus when it comes to packaging. There are some perfumes I might like but can’t buy just because I hate the sight/feel of the bottle, or I hate the way it’s been updated (organza, l’artisan )…others that I find okay as scent but buy because I love the bottle ….if it’s on special ( kenzo, Issey Miyake ). I really like bottles that fit in the palm of my hand, are weighty, and rounded off …..sorry, bit of a digression from your post! I know exactly what you mean about packaging. I’m occasionally drawn to Jean Paul Gaultier’s seemingly endless variations on his original theme, but the bottle is just wrong for me on every level. I’m irritated and not intrigued by Bulgari’s bottle for the Omnia range. Even their bottle for Black is a bit too try-hard for me (because it’s not a comfortable hold, if I may so express myself). And so on….and on…But I think I am NST’s first and genuine grumpy old woman! This cologne, however, is now on my TTL (to try list) against my next trip to the States or Europe. Hah! Opinionated women of all ages are always welcome here. I Have always walked past Omnia, too, for exactly the same reason. My Saturday challenge will be to try it out today – just to clear my conscience. Ha! Me neither. Let’s all make a pact to try at least one Omnia soon. Did it…and survived to tell the tale! Not at all! I could chat about bottles for a long time. I’ve always been a fan of the Rosines — the shape, the texture of the glass, the tassels and bows, the fits-in-my-hand size of the 50 ml. A sheer fabric or a softer yellow might have “matched” this fragrance better — although the polka dots are fun! I agree with Kanuka that the bottle is a bit less than refreshing looking. However, I’m a huge fan of Zeste de Rose and also Rose d’Ete, of which I have a sample. I only have half of my Zeste bottle left, so with so much competition in my collection, that tell you how much I like it. Your description of this new, La Cologne, is very enticing!! I love a good cologne. And I would love to own another Rosine!!! Stay cool. Thank you, AnnS! Things should be more comfortable by the weekend…I hope. I’m glad I have a second vial of this Cologne. Between this and L’Ombre dans L’Eau and 4711, I should be covered! If you like Zeste and Rose d’Ete, you would most likely enjoy this one too! This sounds lovely, but I am unlikely to see it until I venture all the way to Europe or America! I’v just found out that the only shop stocking LPdR is discontinuing them. They no longer have Zeste de Rose which was my favorite, and only have about 6 left in the range. I have to admit to loving the clear glass bottles – especially with the lime green tassel on Zeste… And the powder blue of Ecume is pretty – but I’v never even seen that one. From what they have I have considered Poussiere in the past, but having tried so many orientals and gourmands in the meantime, I have to wonder whether it would still appeal to me. Any lovers of Amour, Homme, Twill, Flamenca, La Rose or Une Folie out there? I also adore La Rose de Rosine — a smooth rose-violet chypre. I like Ecume too. Thanks so much for reply! I’m definitely going to try these again then. I remember liking Twill, even though that’s another “masculine”! Thank you for the nice review Jessica ! NB.